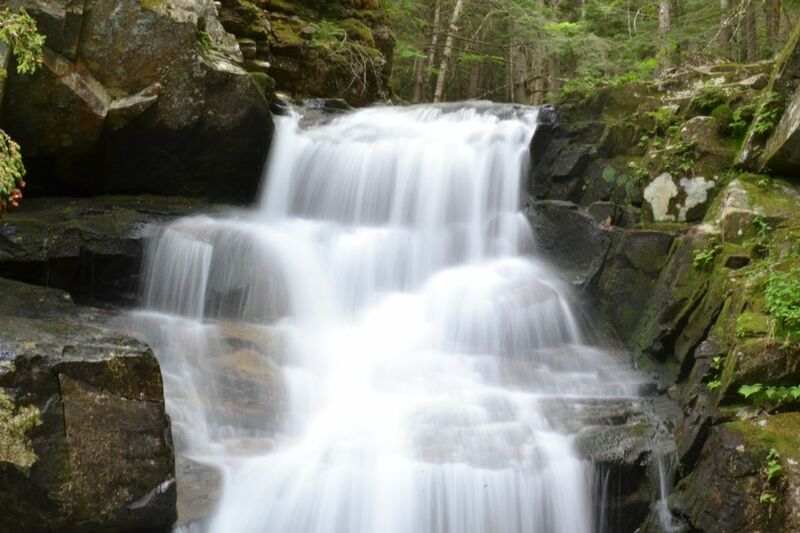 This short hike takes you to four small waterfalls around the bottom of the trail network on the Northern Presidentials. All are very close together; three are on the same stream. The trail is mostly level, with a small incline in some parts. From the parking area, follow the trail to a junction in a power line clearing. Bear left onto Valley Way, then turn left onto Maple Walk. In 0.2 miles, Maple Walk ends at Fallsway. Turn left and walk a few steps downstream to see the first waterfall, Gordon Fall. This waterfall has a rocky, two-tiered drop and is fairly wide. Turn around and continue upstream on Fallsway. After half a mile of easy climbing along the brook, you will reach the second waterfall, Salroc Fall. Signs designate Lower and Upper Salroc Fall. Both are fine cascades, although the upper half is much larger and more graceful. Just above Salroc Fall, the trail intersects Valley Way. Bear left on Fallsway and continue a short distance to the next waterfall. At an intersection with Brookbank, drop down to Tama Fall, a rushing water slide larger than the first two. After enjoying Tama Fall, retrace your steps a short distance to Valley Way and bear left to descend on that trail. After a 0.3 mile descent, turn left onto Sylvan Way for a flat walk through the forest. The trail goes under many sap lines on its way to the next waterfall. In 0.7 miles, just after passing a four-way intersection, arrive at the highlight of the hike, Coldbrook Fall. Coldbrook Fall is a voluminous 40 foot plunge surrounded by a mossy and dark environment. The best view of this waterfall is found on the other side of Memorial Bridge. This is the last stop of the hike; only a short walk back to the parking area remains. From the end of Sylvan Way, bear right onto The Link (do not cross the bridge), and walk 0.6 miles back to the power line clearing.